When it comes to hockey, Courtney Burke is nothing if not focused. At 13 years old, the New York native went from being within earshot of her family in the house in Albany to being more than 1,200 miles away when she packed her bags for Shattuck-St. Mary’s in Fairbault, Minn., with the dream of furthering her hockey career. It was that same dream that provided the impetus for Courtney’s decision to attend the University of Wisconsin. 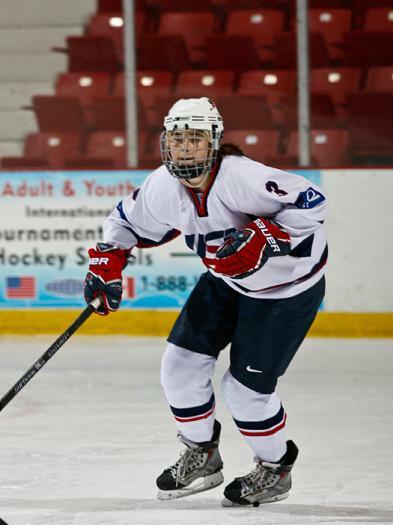 “It just felt like the right fit for me,” said Burke, a 17-year-old defenseman with the U.S. Women’s Under-18 Team. But even as remarkable as that focus might seem, it’s dwarfed by the drive she displays when she laces up her skates. That should hardly come as a surprise when you consider all that she’s already accomplished in her still-budding career — not least of which was the integral role she played when the U.S. Women’s National Under-18 Team captured gold in 2011 at the IIHF Women’s World U18 Championship in Stockholm. “It was unbelievable because you heard all of our parents in the stands and the horns,” said Burke, who recorded four assists during the tournament. These are the memories that push Burke to work hard every time she’s on the ice. As a two-time participant in the Women’s National Festival in Blaine, Minn., Burke has had a chance to test her skills against members of the Women’s Team. “Playing with them shows me the level I still need to get to,” she said. “They are bigger and stronger. They have more experience. Burke is hardly one to shy away from hard work. 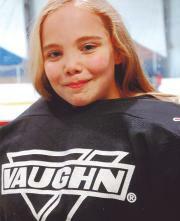 Even while at home for the summer, she gets private hockey lessons three to four days a week to work on her game. For all she’s already accomplished on the ice, and in the classroom, Burke has bigger dreams on the horizon that would make all the hard work well worth it. Courtney Welch is the manager of Communications & Social Media for USA Hockey. Like any goaltender, Naomi Leasck’s saves are important to her team’s success. But each save she made as a member of the Cyclones Squirt 1A team meant even more this past October during National Breast Cancer Awareness Month. That’s when the 12-year-old from St. Louis raised money for every save she made during her team’s games. Through 10 games, Naomi stopped a total of 244 shots, which yielded $4,250 for the local chapter of the Susan G. Komen foundation. This was Naomi’s third year of raising money and every year her totals have increased, thanks to the generosity of the local community. Naomi is already making plans and setting even higher goals for next year’s fundraiser.